I don't mind a last minute Jalie sew, really I don't. So, when A told me at the end of last week that her end of term gymnastics classes on Tuesday/Wednesday were Circus theme I kicked into gear. The pattern is Jalie 3247, View A crop top and View C shorts. The fabric was something that a friend at school had given her when her mum had heard that A's mum (me) sewed. The top is a racer back, which I forgot to photograph from behind in the rush to get to gymnastics, and is finished with fold over elastic. I had a bit of pink from a trip to Eliza's but not enough, and some multicoloured that was a free gift included with an order from Sew Active Fabrics. Mismatched elastic bindings is perfectly legit for last minute costumes. The crop top was lengthened to be a short singlet. Apparently crop tops are not allowed at gymnastics but ludicrously short singlets are. Seems like semantics to me, but hey. The shorts in this view have a self fabric waistband with no elastic and they're great. This would make a really good swimwear pattern. 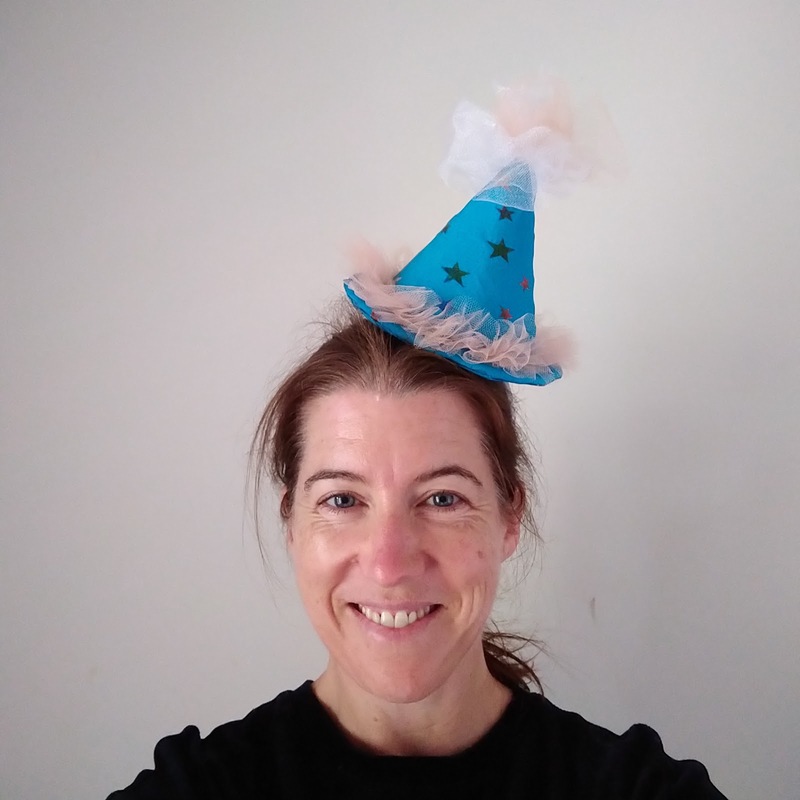 The tulle skirt is from book week a few years ago and then I made the hat with a cone of cardboard, a head band, leftover tulle and a glue gun. Fun times! Modifications: about 15cm added to length of top and hemmed with no elastic. You've aced the last-minute sew as usual. A is one lucky girl! Thanks Marisa. The last minute stretch fabric overlocker sew is definitely my strong point!